The toe skin is peieced by the nail as it curls, which becomes red, swollen and tender. When pressure is placed on the toe it can feel particulary painful. How can we treat your ingrown toenail and allieviate your discomfort. Education:- We will advise you of good foot hygiene, suitable footware and good foot care practice to prevent infection. We offer a service in which we trim the nail straight across to help prevent it continuing to dig into the surrounding skin. We can also provide pain relieve for this uncomfortable condition and in simple cases will remove the offending spike of nail and cover with an antiseptic dressing. Surgery may be recommended in cases where an ingrown toenail is more severe. This may involve either removing a section of the affected toenail or removing the whole nail. At Parkview Podiatry we have an excellent Surgical room in which we perform the surgery in sterile conditions. If you have bleeding or discharge from an infection, or even excessive healing flesh (hypergranulation tissue) around the nail, we may prescribe antibiotics to beat the infection as well as having the offending spike removed. If you are particularly prone to ingrowing toenails from problems such as poor gait, we can recommend correction of the underlying problem. 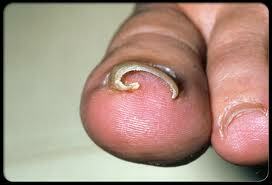 Left untreated, an ingrown toenail can cause the toe to become infected, please give us a call if you are suffering. It is very important you visit us if you have diabetes and an ingrown toenail. Having diabetes could affect the healing of your toenail, particularly if your diabetes is poorly controlled.